We all know the importance of displaying student work. Displaying student work send the message that the teachers and community values the work they do. It allows opportunities for students to learn from each other and make connections that they might have otherwise missed. Unfortunately, not only do we have limited wall space, but the classrooms displays need to be taken down to make room for new work. All that hard work gets given back to the students and usually gets tossed out for recycling as soon as it gets home. You might think to take a picture of the display, but the pictures seldom not come out well enough for students to use them as reference. You might also be thinking about the impossibility of these classroom displays to show growth of a student or even whole class over time. This is where digital tools can come in handy. Shared with me by fellow Edmodo user Christi Collins, Thinglink is touted as the "leading platform for creating interactive images and videos for web, social, advertising, and educational channels." This user friendly digital tool provides students and teachers with the ability to turn any image into an interactive graphic. You can create multiple clickable spots within an image, and turn them into a multimedia launcher that can be used to include other images, video, audio or provide a link to any URL. SpicyNodes is a mind mapping tool that provides "a way to visualize online information that mimics that way that people look for things in the real world. Bits of information — such as text, links, photos, and other media — are placed into "nodes," which are then linked together in an appealing interface that invites exploration." 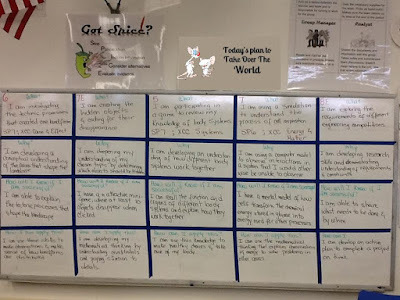 You can use spicy nodes to display student work not only for the sake of sharing, but also to provide opportunities to make connections between the different pieces of work that they created themselves. Hstry is a web platform that allows students and teachers to create and explore interactive timelines. However, it really is so much more than a timeline. You can use it to create assignments and projects, the students can use it to create responses and draft portfolios. 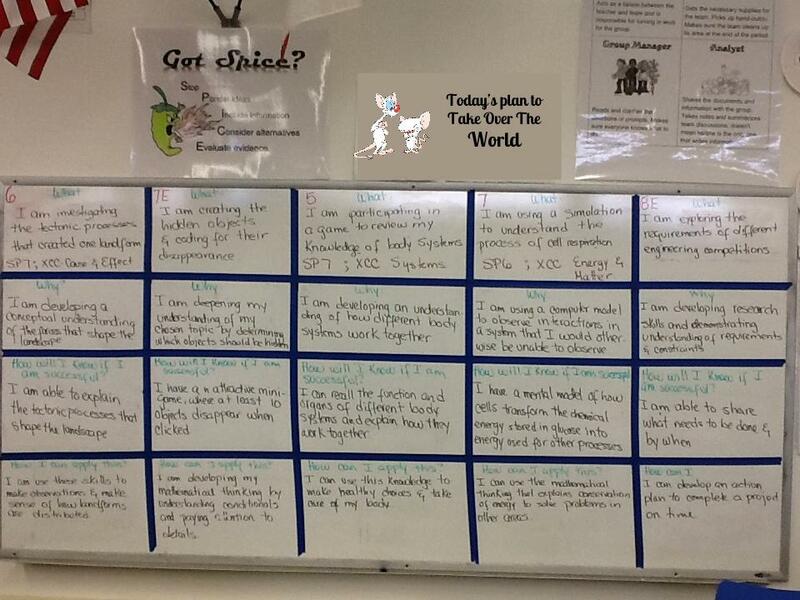 You can even use it as I did here to create an interactive display of student work. As with the two previous ones, the user can insert images, videos and text. If you use it for assignments, you can even include formative and summative assessments! All of these were created with the same body of responses to a single assignment as a way to show you the possibilities of each webtool. Have you found other digital ways to display student work? Share them with us in the comments so we can all benefit. Teach students to "Take Over the World"
Why (are we learning it)? All of this was fine and good. The kids got a kick of asking every day, and smiled as I responded the same way every time. Enter Nick into the classroom, one of those bright students that often push your pedagogy forward. As we repeated the same questioning about taking over the world, he raised his hand and asked that all important question, "Mrs. Garcia, exactly how are we supposed to take over the world?" Fortuitously, I had just read an article on Edutopia describing Costa and Kallik's Habits of Mind, and in that magical moment it came full circle. I was not able to identify all 16 habits of mind for Nick on that day, but I remembered enough to say "Well, you would need to persevere and think creatively. You cannot take over the world if you give up or if you do the same thing as others are doing, right? So, let's get started with our lesson for today." We went about our business that day, but by the next day, I had done more reading, printed out some art for my walls and even developed a slide deck identifying each of the habits. I tabled my science lessons in favor of a lesson entitled "How to Take over the World". We went over each of the habits of mind, and I encouraged the students to not only discuss each one as they were presented, but also to find examples of the habits they were already practicing. We had conversations about practicing to get better at soccer and at playing a videogame, the difference between hearing and listening and how they apply knowledge to new situations, amongst others. The students were able to see that the habits of mind we were talking about could guide us in our ultimate goal "To Take Over the World". The moment has since past, but we have constant reminders in our Plan Board, the posters I hung on the walls, and the slide deck (which I turned into a screensaver for our classroom devices). Since then, the habits of mind are ever present in the conversations between myself and the students, "I see that you checked your work a couple of times. You are on your way to take over the world. ", and between the students themselves, "How are we going to take over the world if we do the same thing as everyone else!" And that, my noble readers, is how I know my students are getting ready to take over the world. I invite you to joint the conversation by posting your questions or comments.